Part 2 of this corner was once part of a large, marshy lake that neither the Walls nor attackers could easily cross. The trail in this part starts where you come off the Walls at a complex of road junctions and bridges and ends where the Walls begin again at Red Tower. This part of the trail heads more directly south than part 1 and, with part 3, cuts the angle off the east corner by going in a single slight curve to the next bar. 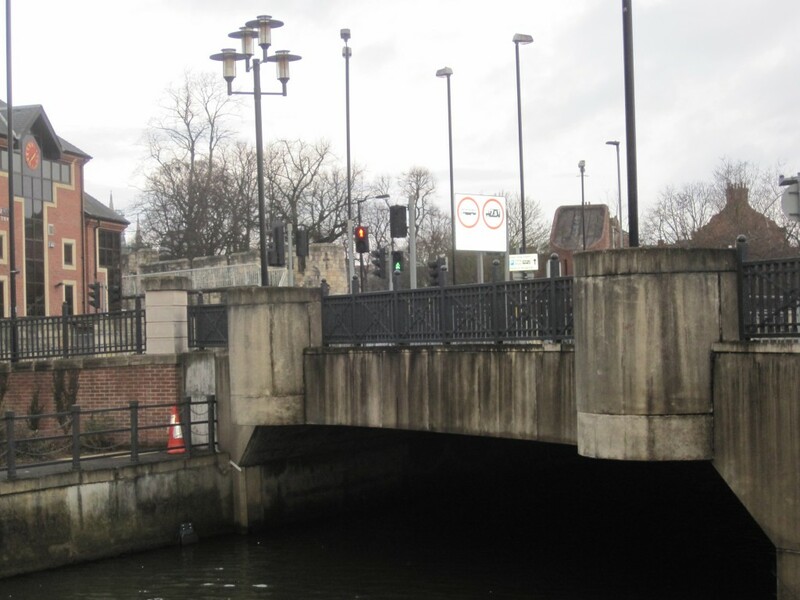 You have three flows of traffic to cross using traffic lights: turn right as you get off the walls and almost immediately cross left to a small traffic island, then turn right and cross two flows of traffic to get to a pavement on a bridge over the River Foss. Turn left and stay on the pavement, walking beside the river. Carry on walking along this pavement even when the river curves away, then you have to cross a road in order to keep straight on, very soon after that you see Red Tower on your right. The river you walk beside here was made into a great lake by William the Conqueror around 1068 when he ordered it to be dammed to create a moat around his castle half a kilometre downstream. 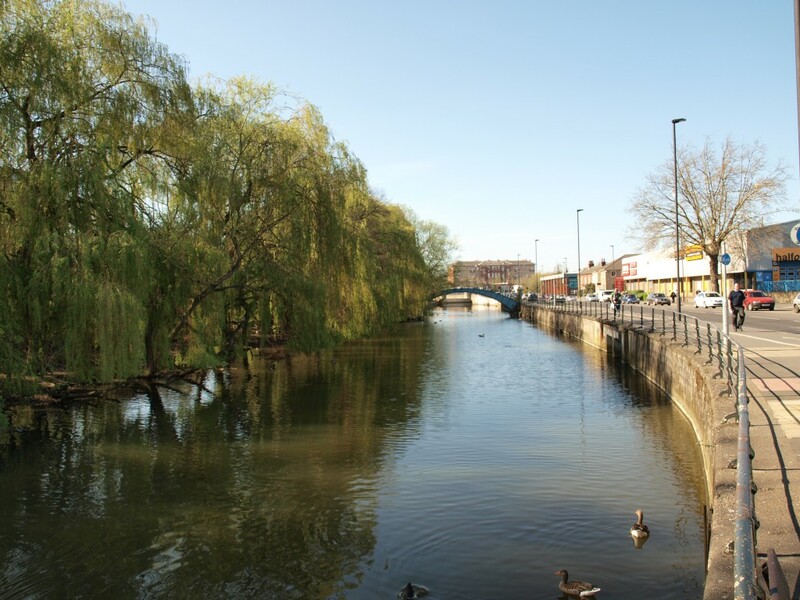 More than 700 years later the river was canalised and then the Victorians built up the level of the silted-up lake. 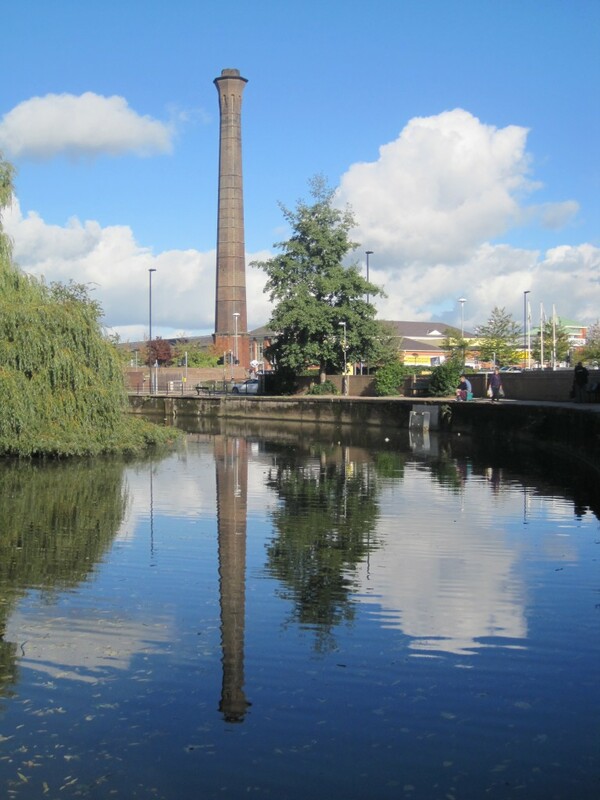 If you look down the river immediately after you’ve left the river’s side you’ll see a towered, red brick Victorian warehouse come into view, barges travelled on the Foss and unloaded here [most recently for Rowntree’s sweet factory so it is called Rowntree Wharf]. Now the warehouse is converted into homes and offices –and it is mainly water birds that go up and down the river. At the very start of this section of the trail there is an information board about a lost Postern and the lake that once stretched from here [don’t believe in the public toilet it shows as close to you, this also seems to have disappeared] and one of the metal maps for rubbing [see the “Information Boards” section in the Appendix]. Before crossing the road and river you may wish to visit a hidden garden just off the trail – see “Off-trail extras: 1” below. This is a very old crossing point on the River Foss, when the modern bridges were being built a cobbled Roman ford was found here – about five metres below the present bed of the river. Once you have crossed the Foss the trail along the pavement seems to have lost some of its way-marking brass studs when it lost its Victorian “York stone” paving slabs. Some find this the least interesting section of the whole trail but others call the Foss “the largest industrial archaeology monument in York” and remember that canals like this were the superhighways of Georgian times, vital for Britain’s industrialisation. 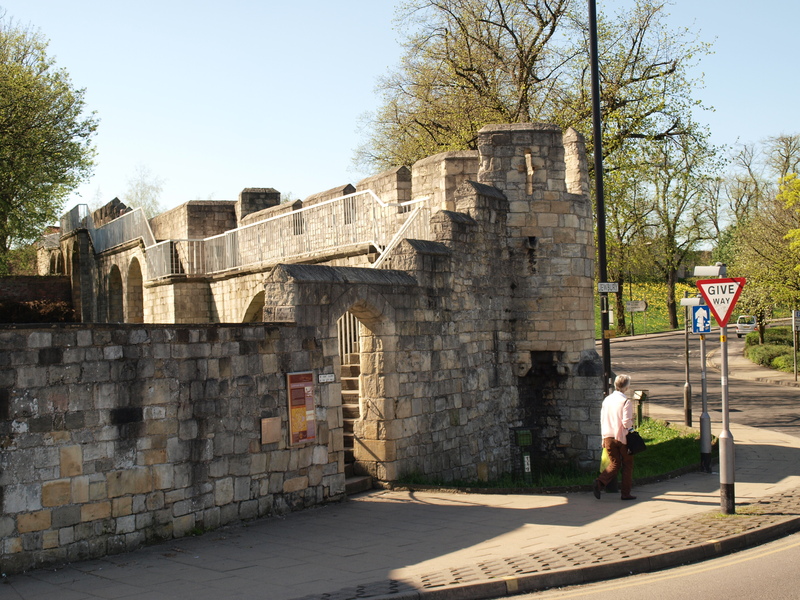 Further details about this part of the east corner are best dealt with as views and as a story from the history of York. From just over the bridge: you can look back to the modern bridge you have just crossed and beyond this to the Walls you have left and the Minster; the bridge with its round tower-like extras quietly echoes the Walls but the road junction itself has been criticised for its muddle of multiple [50? ], mixed poles and lamp-posts. A little to the left of the Walls is the medieval church of St Cuthbert’s but the buildings around you are late Victorian or later, built on what was marshy lake, the tall brick chimney [in the opposite direction from the Minster] was for a Victorian waste-incinerator. If you look down the River Foss you can see an arched metal footbridge [usually closed] which leads to a small nature reserve by a quiet backwater. This reserve was used to reintroduce swans to the river in the 1990s; as well as swans you can probably now see moorhen, coot, ducks and geese -the geese which are grey and fawn [with no black] are “greylag geese”, in medieval times they came to England for the winters then lagged behind when other geese left, farm geese were bred from them and they were hunted for food. 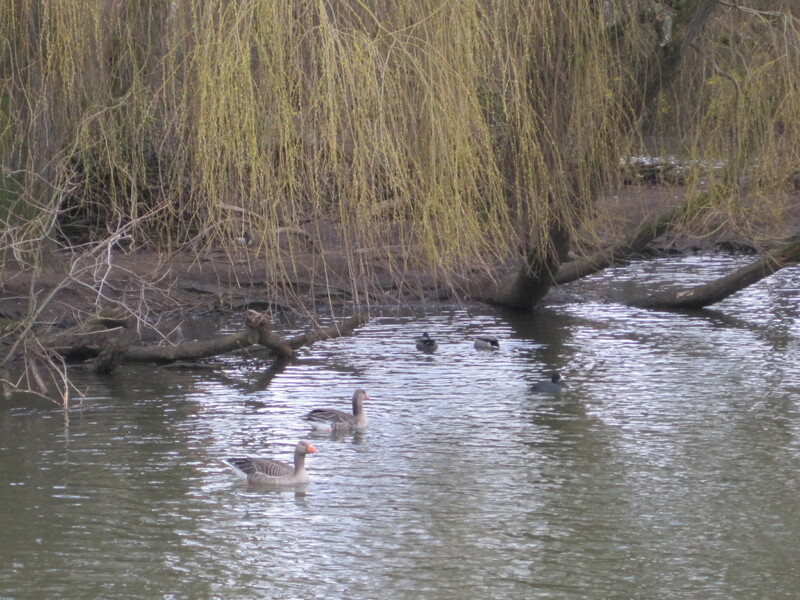 The King’s Fishpool didn’t only provide bream and pike to eat, it also provided waterfowl like these. From just after the arched footbridge on your right: you can look over the river and through the weeping willows to the nature reserve with its backwater and get a small impression of what this whole area was once like in summer when the waters of the lake sank and many low islands appeared. The shallow lake stretched for about a hundred metres in front of you and more than 200 metres behind. The road that runs along the river here is called Foss Islands Road. 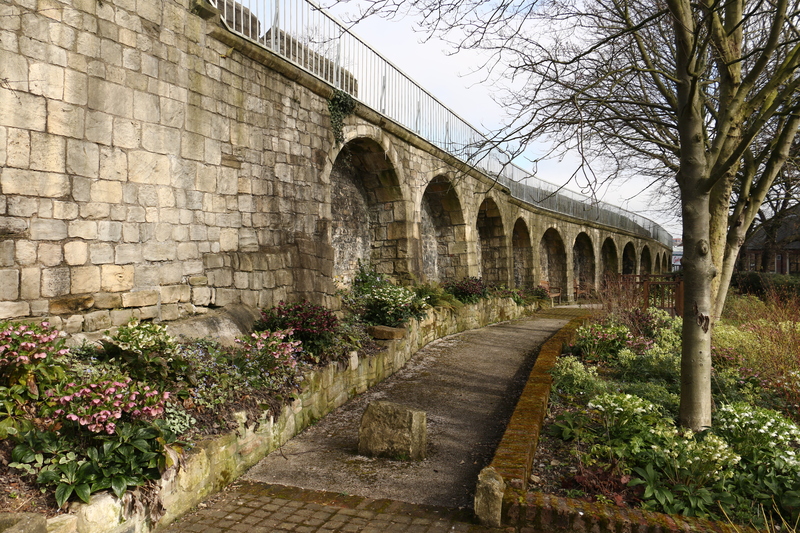 It is part of what York calls its inner ring road, almost the only part that looks anything like the 4-lane road-around-the-Walls that some people were planning for York about 50 years ago; the plan was strongly opposed by local groups –and was defeated, partly because it was thought that such a road would be a poor setting for the Walls. A small quiet, public garden just below and inside the Walls was mentioned at the end of the “basics” for the first part of this corner. It is as good as a newly established garden without lawns can be and has many benches. The two entrances are easy to miss and about 80 metres from the Walls trail. 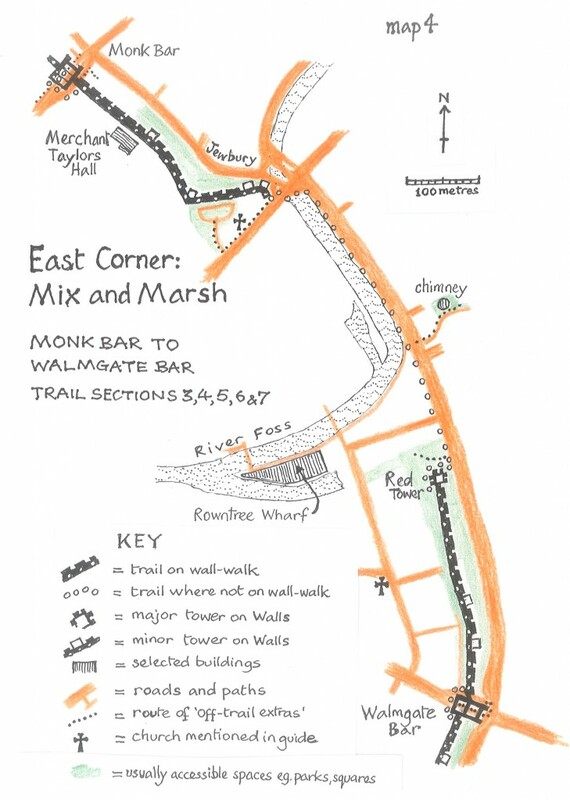 At the very start of this second part of the east corner of the trail, turn right as soon as you come off the Walls and carry on along the pavement instead of crossing the roads on your left. 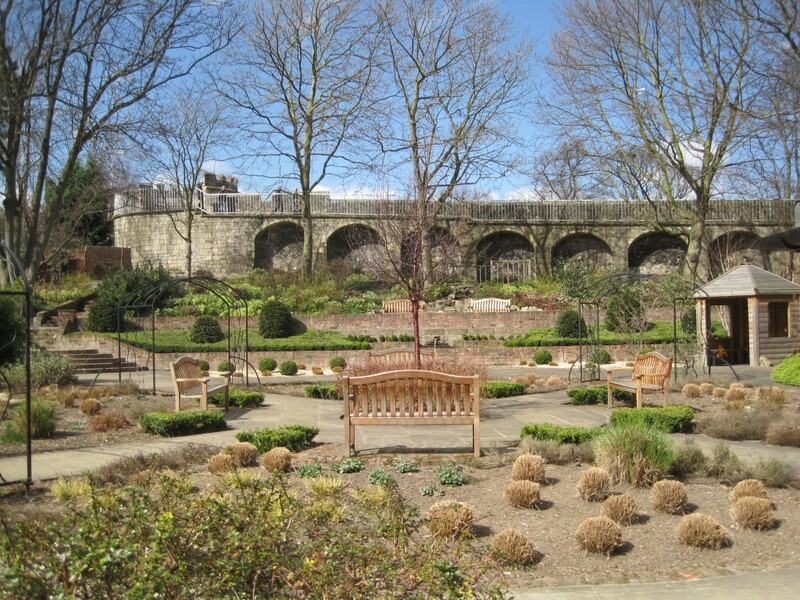 You pass the medieval church of St Cuthbert’s then find the entrances on your right just before the Quilt Museum -the museum is housed in St Anthony’s medieval guild hall and the official name of the garden is “St Anthony’s Garden”. As you reach the entrances you may be tempted by the look of the Black Swan, an old and popular half-timbered pub a little ahead of you on the other side of the road –this is very understandable but at least go into the garden first, it is lovely. The café of Morrison’s supermarket is conveniently close to the trail [its toilet is next to the café]. 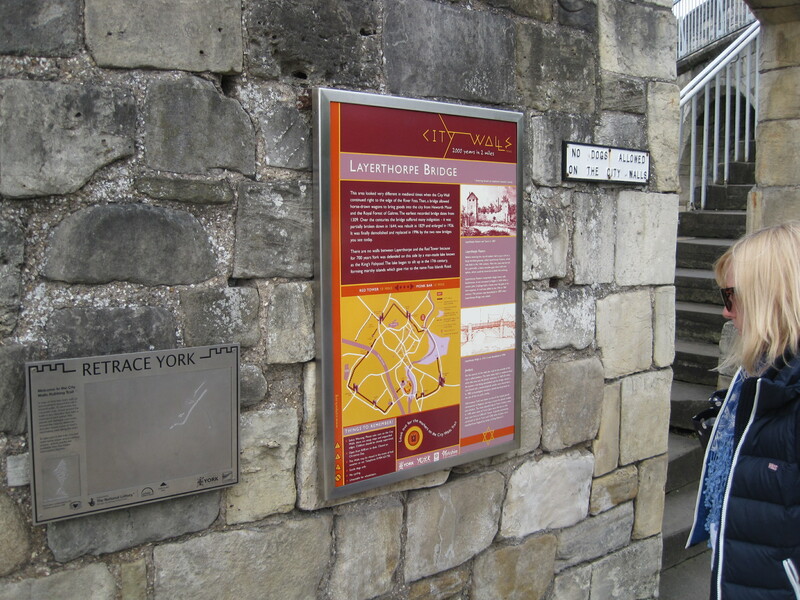 It could not be better signposted because it is at the bottom of the huge [by York’s standards] Victorian chimney you see to your left as you walk along the pavement by the river. Leave the trail by a part-pelicon crossing [to your left when you are just past the closest point to the chimney], then go up a short red-brick path till you get to the red-brick chimney. You’ll see an entrance to the supermarket just in front of you, inside there is everything you’d expect of this expanding, Yorkshire-based supermarket chain –even a small display about “the Destructor”, the Victorian incinerator the chimney was built for [the story below has more details]. Morrison’s originally thought it could be better signposted, it planned to write “Morrison’s” down the chimney but was told this was not how York dealt with its historical heritage! When you first see the Red Tower you will see a small garden between you and it. 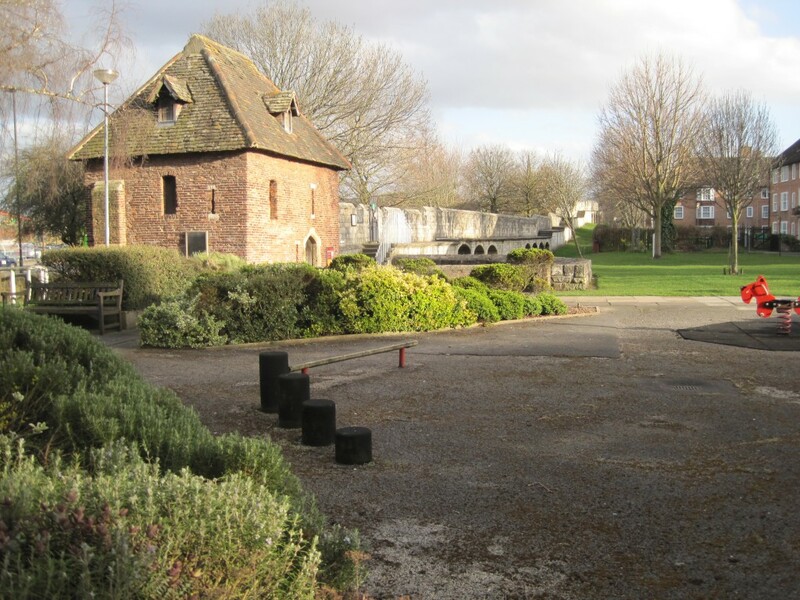 This is part of Rosemary Place, it has ordinary benches and picnic benches, a few things for young children to play on –and even some bushes of rosemary. You are surrounded here by some of the most conveniently placed council housing in York. It is allocated especially to people with mobility problems. At one time the people who lived in the poor bit of the city beside the lake complained that they could not hear the priest in their parish church because of the noise of dogs fighting over the butchers’ waste dumped outside. In the mid 19th century what was left of the lake was seen as a health hazard, it smelt and this was thought to be linked to sickness like the cholera epidemic of 1832. 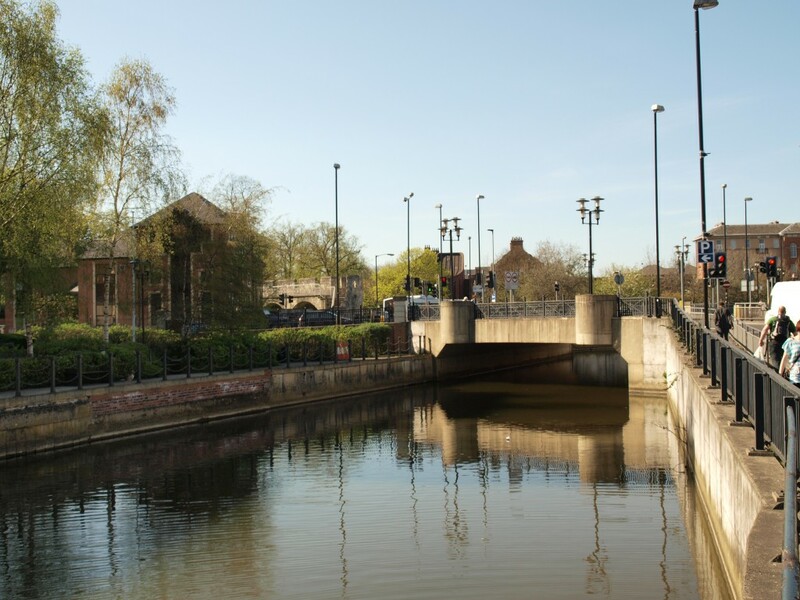 So instead of trying to keep the area clear of rubbish, the corporation decided to concentrate rubbish here to help build up the ground level –people were paid a bounty by the corporation if they dumped a cartload of rubbish in what was once the King’s Fishpool. When the ground level was thought high enough York people still used rubbish here. In 1899 the big chimney was built for an incinerator, this burnt the city’s rubbish. It was called “the Destructor” but did more than destruction, it was part of an early try at energy efficiency. The chimney was shared with an electricity generator and when rubbish was burnt the heat was used to generate steam which worked a stone crusher, a mortar mixer and, if there was any energy left, the generator. Waste is still managed near here, 200 metres east of the chimney, where the edge of the lake once was, is York’s central waste and recycling centre.